Yes, you're truly gorgeous when you're dead silent. Your eyes sparkle with a devilish glow when I can't hear the sound of your honking mouth. I've never seen anyone with a figure and style as smashing as yours when you button it up. You say the wisest things when your lips aren't moving. You're stunning when you're silent. I always smile when I think of you not talking. 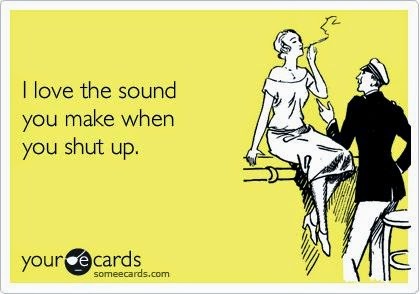 Ah, the sounds of silence. Simon & Garfunkel were so far ahead of the game, weren't they. Some things are just so obvious and they need to be said - and then you need to just SHUT UP. That's what makes people happy. Go figure.